Here is a recording of Hymn No. 21 from the “Hymns of Dawn” to aid God’s people in singing and making melody in their hearts unto God. To make them sons of God. For Christ’s joint heir and bride! As Christ, The Lord, is pure. To dwell within each heart. And He the kindred owns. Author — Isaac Watts (1674-1748). Verse 2 in the “Hymns of Dawn” is not contained in the lyrics written by Isaac Watts and could not be found in any other Hymnal other than in the Hymns of Dawn. Composer — No information. From a Google search, the earliest record of the same tune as contained in the Hymns of Dawn, has been found in the “Songs for Social and Public Worship” published in 1863, on page 144. Another tune arrangement (nearly identical to the “Hymns of Dawn” score) is found in “Every Sabbath: A new collection of music adapted to the wants and capacities of Sunday-Schools, the home circle, and devotional gatherings,” page 147 Hymn No. 145a published in 1874. Titus 2:11-14 (ESV) — “(11) For the grace of God has appeared, bringing salvation for all people, (12) training us to renounce ungodliness and worldly passions, and to live self-controlled, upright, and godly lives in the present age, (13) waiting for our blessed hope, the appearing of the glory of our great God and Savior Jesus Christ, (14) who gave himself for us to redeem us from all lawlessness and to purify for himself a people for his own possession who are zealous for good works. The words below are from Reprint No. 2283, from the Original Watchtower and Herald of Christ’s Presence. “For the grace of God that bringeth [leads to] salvation hath been manifested for all men—teaching us that renouncing ungodly desires we should live soberly, righteously and godly in this present age, waiting for the blessed hope, even the glorious manifestation of our great God and Savior Jesus Christ; who gave himself for us that he might redeem us from all iniquity and purify unto himself a peculiar people, devoted to good works.”—Titus 2:11-14. The word grace signifies favor—particularly unmerited [not deserved] favor. Acts of grace are thus to be clearly distinguished from acts of justice and from obligations… Every testimony to the effect that God is extending his “grace” to humanity or to the Church is a testimony to their unworthiness to justly demand those favors or blessings. The spirit of the world in general is that of self-sufficiency and independence; following their own wisdom and lacking the instruction and wisdom from above, the worldly-wise regard themselves with complacency; they believe themselves to be quite sufficiently righteous to merit a good deal of divine blessing and reward: true, they admit also that they have imperfections, but these they expect to pay for to the full according to some law of divine retribution. Hence they are undisposed to look for or to accept pardon, forgiveness, justification through the great sacrifice for sins which God has provided… And so they regard all of the laws governing humanity as merciless, graceless—strictly just. The Scripture presentation of the matter does not overlook the law of retribution—that sin of any kind, the transgression of any law, will surely bring its penalty, whoever may be the sinner and whatever may be the conditions. And the propositions respecting divine grace, rightly understood, are not in conflict with this universal law of retribution: the proposition of grace is … not to prevent the wages of sin from following transgression, but to succor the repentant who desire to reform, and to help him back to divine favor and full recovery, along the lines of strictest justice;—by a willing ransom-price. And since this succor is wholly unmerited on man’s part and without just obligation on God’s part, it is purely of divine favor—”grace.” Indeed, if it were not for sin and its retributive punishments, there would be no room for grace: it is man’s necessity for grace that constitutes the divine opportunity for its exercise. Grace, however, operates in harmony with the divine laws, and not in violation of them. (1) The first movement of divine grace toward mankind was the exercise of benevolence, love and compassion toward mankind in his fallen and sinful condition. There was nothing in man to merit this compassion and sympathy; quite to the contrary: we were aliens from God and enemies of his righteous rule through wicked works,—the depravity wrought in us through sin voluntarily committed by father Adam. 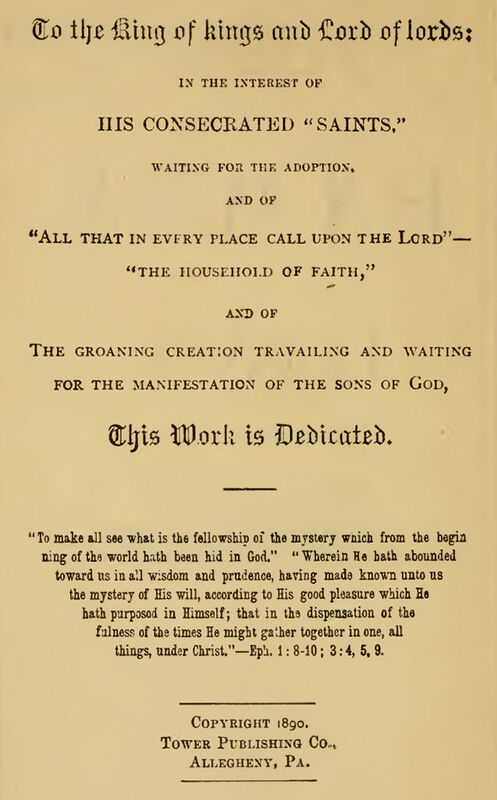 (2) It was in harmony with this thought of grace on God’s part, or, as we might term it, God’s gracious plan, that he revealed something respecting his purpose of ransom and restitution to father Abraham;—thus preaching first, beforehand, to him the good tidings of a coming blessing or grace, saying, “In thy seed shall all the families of the earth be blest.” Abraham, and others who believed God, rejoiced in mind under the influence of this gracious promise—altho even the beginning of its fulfilment was still nearly two thousand years off. (3) The third step of grace was in the great gift of divine love, our Lord Jesus Christ. It included the gracious arrangement made with the only begotten Son of God, on account of which he joyfully laid aside his heavenly glories and conditions and humbled himself in death as the ransom or substitute for the first Adam and thus incidentally a “ransom for all” [1 Timothy 2:6] the race of Adam. (5) Throughout this Gospel age the same grace has been in operation doing a twofold work; (a) justifying repentant believers from the guilt of their moral obliquity, and giving them thus a standing before God in Christ’s imputed righteousness;—thus making them eligible to the “high calling” to divine sonship and to joint-heirship in God’s Kingdom to come, and (b) then extending to them that “high calling,” inviting them through the divine Word to become the “very elect.” True, there are conditions imposed, and not all the many “called” will be among the few “chosen;” but nevertheless it is an inestimable privilege to be “called” and to have put within our grasp the opportunity and all the needful helps, whereby we may make our calling and election sure. (6) The grace of God will still further be manifested when the “elect” Church shall all have been sought, found, tried, disciplined, and “made meet to be partakers of the inheritance of the saints in light;” for the blessings which will be conferred upon this glorified Church will not only be such as were not merited, such therefore as were not of obligation upon God’s part, but according to the divine testimony they will be additionally great, super-abounding in grace, “exceedingly abundantly more than we know how to ask or expect;” for “eye hath not seen, nor ear heard, neither hath entered into the heart of man, the things which God hath in reservation for those that love him.”—1 Cor. 2:9. (7) Even then, God’s grace will not have exhausted itself;—even after having thus honored and blessed and exalted the Church, the body of Christ, whose only merit consisted first in an honest confession of sin and an acceptance of the divine favor, and second, in their “reasonable service” in rendering their lives in obedience to him who bought them and in and through whom the divine graces were extended. Then divine grace will begin to be fully manifested—then all shall see it, all shall know it, and all who will may share it; for then will begin the glorious [R2284] “times of restitution of all things, which God hath spoken by the mouth of all his holy prophets since the world began”—the Millennial age of a thousand years; the time when the knowledge of the Lord shall graciously be caused to fill the whole earth; the time when all the sin-blinded eyes shall be opened; the time when all the prisoners of the pit (death) shall come forth, that they may be instructed in righteousness. Then, according to the grace of the divine promise, he who redeemed the world shall judge the world in righteousness, a trial, an opportunity, that whosoever will, with a knowledge of sin and its penalty, and with a knowledge of righteousness and its rewards, with a knowledge of the goodness and grace of God shining in the face of Jesus Christ our Lord, may then stand trial and be judged as to whether they will receive God’s grace and its provisions of eternal life, or whether they will reject these and die the second death. Here we behold the wonderful steps of grace. No one can intelligently believe in divine grace who holds the theory of evolution or any other theory of salvation than the Scriptural one, which recognizes man’s original creation in the divine likeness, his fall into sin and death, his redemption therefrom by the death of our Redeemer, and his hope for recovery through divine grace extended now to the Church and to be extended by and by through the Church (under Christ its Head) to all the families of the earth. If we are to be punished in proportion to our shortcomings and rewarded for our obedient deeds, where would be the “grace?“ Where would be the mercy? Where would be the necessity of a Savior, a sin-offering, an atonement and a reconciliation with God? Where would be the peace through our Lord and Savior Jesus Christ? None of these mercies and blessings can be rightly recognized except as the grace of God (his unmerited favor) is seen in them. The fact is that the divine standard of righteousness is much higher than men generally understand: with God righteousness is synonymous with perfection; and hence “all unrighteousness [all imperfection, however or whenever or wherever]—is [a proof of] sin. Thus all men are proved to be sinners,—because all are imperfect, un-right. And the divine law is that the sinner, the wrongdoer, the un-right, the imperfect, shall not live. “The wages of sin is death.” Whoever [R2285] understands this can see at once that man’s only hope of eternal life lies not in his own perfection, but in divine mercy, grace. Our blemishes come to us from our parents, not from God. The Scriptures not only point out to us father Adam’s sinless perfection, saying that he was created in the image of God, but they plainly declare that it was by his disobedience that the divine sentence of death passed upon him and passed as an inheritance, a legacy of evil, to his offspring, saying, “By one man’s disobedience sin entered into the world and death as a result of sin, and so death passed upon all men, for all are sinners [imperfect].” Truly also, “The fathers have eaten a sour grape [disobedience] and the children’s teeth are set on edge.”—Rom. 5:12,17-19; Jer. 31:29; Ezek. 18:2.
an acceptance of Christ Jesus as the personification of divine grace. Upon no other condition can we step into this grace of God or walk in its way and inherit its rewards. And even after we have received Christ and God’s grace in him, and are no longer recognized as strangers, aliens to God, but sons, as servants of righteousness and no longer servants of sin, being imperfect, we are not free from blemishes of word, thought and deed; yet, God’s grace … continues with us to cover our blemishes until perfected in the resurrection. Under its provisions whatever is contrary to our wills, and purely the result of hereditary weakness, may be forgiven; and our obliquity and blameworthiness be gauged only by the measure of wilfulness or assent connected with the wrongdoing. Nevertheless, to some extent, chastisements or natural penalties for violations of law may be expected: but to those under grace these will come as helps by the way, causing them more and more to detest sin, as corrections in righteousness, as chastisements and disciplines for their blessing. And even these sure penalties may be to some extent ameliorated in accordance with the wisdom of our great High priest, who, having borne all our sins in his own body on the tree, is freely empowered to abate for us so much of the penalty of our misdeeds as grace may be able to cover as un-wilful [accidental, not deliberate] transgressions. Judged from this same standard, how many Christians today have backslidden—fallen from grace—lost the trust in the merit of the precious blood and in divine favor extended to us through the great atonement sacrifice. Now, as then, the disposition is to trust to works of our own righteousness, which … our own consciences should prove to us are imperfect, “filthy rags” unfit and unable to cover us. Yes, we need a covering before we could in any manner or degree hope to be acceptable to God, and this covering of our imperfections with the imputed righteousness of Christ, is another statement of the grace of God extended to us. This tendency to depart from a recognition of God’s grace in Christ as our only hope for eternal life, and to take instead a hope of being able to walk righteously and to do justly, and thus to merit eternal life, is what the Apostle very properly calls “another gospel”—a false gospel.—Gal. 1:6. This thought of the divine grace as the basis of all our mercies is interwoven with all the promises of God’s Word. Thus the Apostle speaks of the gracious plan of God, and Christ as the exponent of that plan as “the grace of God and the gift by grace.”—Rom. 5:15. Our approach to God in prayer is spoken of as an approach, not to the throne of justice and equity, but as an approach to “the throne of grace,” where “we may obtain mercy and find grace to help in every time of need.”—Heb. 4:16. Again we are exhorted that our hearts be established in grace; and again told that unto every one of us is given grace according to the measure of our faith; and again the Apostle declares of himself, “By the grace of God I am what I am” [1 Corinthians 15:10]. According to the testimony of our text this grace is general, “for ALL men,” and must therefore ultimately in some manner or other be extended to all men,—the dead as well as the living. The translation of our Common Version is manifestly faulty here; all men, even in this most enlightened day of the world’s history, have not yet beheld God’s grace in any degree, nor has it as yet brought them salvation. But since it has been provided freely for all, so ultimately it shall be extended to all, that all may avail themselves of it. The teaching of this grace is not that we may continue in sin that grace may abound; for divine grace is intended to benefit only those who renounce sin and become servants of righteousness: and thus, as our text declares, God’s grace teaches us that we should repudiate sin and live separate from every ungodly desire, in righteousness, soberness and godlikeness. Furthermore, as our text declares, this grace of God does not claim to have reached its completeness, and to have accomplished in us and for us the grand designs of the God of all grace. On the contrary, it teaches us to WAIT for the consummation of this grace until the glorious manifestation of the Son of God in the majesty and power of his Kingdom, to unite his Church with himself as his Bride and joint heir, the channel of mercies and blessings through which God’s grace shall flow to all the groaning creation.—Rom. 8:18-22; 11:31. “We then as workers together with him, beseech you also that ye receive not the grace of God in vain.”—2 Cor. 6:1. This exhortation is addressed to such as have already recognized God’s gracious character and the gift [R2285] of his grace toward mankind,—the redemption which is in Christ Jesus. The Apostle has just been explaining this matter of how God’s grace had provided a reconciliation; “that God was in Christ reconciling the world unto himself, not imputing their trespasses unto them [but unto him who died for them].“ He declares himself an ambassador on behalf of God to declare this grace and exhorts his readers not only to accept of God’s grace in the forgiveness of sins through Christ, but additionally that they also should become fully reconciled or completely in harmony with the Lord, as would be represented by full consecration to him and his service, after the example of the Apostle himself. We take it that this exhortation of our text is the equivalent of the same apostle’s exhortation elsewhere, namely, “I beseech you, brethren, by the mercies of God [already brethren because already believers in Christ and partakers through him of divine grace], that ye present your bodies living sacrifices, holy, acceptable unto God, which is your reasonable service.”—Rom. 12:1. In our text the Apostle distinctly implies the possibility that some may receive the grace of God in vain—to no purpose. We see from the connection as we have examined it, that he refers to the grace of God in justification, the forgiveness of our sins, and not to the second step of grace, our acceptance to the new nature through the begetting of the spirit. This implies, therefore, that the only object of justification by faith in this present age, is to give us a footing, a standing of acceptableness with God, from which we may be able to advance and take the second step of self-sacrifice, and become joint-heirs with Christ in his Kingdom. Nevertheless, this first step and all the privileges and blessings connected with it would be “in vain,”profitless to us, if we fail to take the second step, the particular feature of the divine plan which belongs to this Gospel age. We are not to add to the Word of God, and to say that to receive justification in vain (by not making use of it to progress to a complete consecration and newness of nature) would mean eternal torment, or even the second death: we are simply to understand it as it reads, that the intention of the grace of justification, the first step, being to qualify us for the second step, those who fail to take the second step will have no particular benefit accrue to them from the first step, which would thus have been taken in vain, profitlessly, without permanent results and advantages. … Only those who take the “narrow way” will gain any prize offered during this Gospel age, which is specifically the age set apart for the development of the “royal priesthood,” devoted to good works—to self-sacrifices in the service of the Lord and his cause. Indeed, there is only one prize and one hope of our calling during this age—the other prize and other hope and other call will be in the age to come. We cannot therefore expect that any who take the first step of faith in Christ, and who are therefore temporarily justified because of their faith, will have a reward for a faith which did not work by love. The faith that works by love speedily goes on to full consecration and self-sacrifice, and is a sure indication of the kind the Lord is seeking for his “little flock,” the “royal priesthood,” the “joint-heirs.” The faith, therefore, which refuses to work by love, cannot be considered an acceptable faith in God’s sight. Nor can we expect that this class will be counted worthy to share in the earthly phase of the Kingdom with Abraham, Isaac and Jacob and all the prophets. A much misunderstood text respecting grace is the one used as a caption for this article, namely, “By grace are ye saved, and that not of yourselves, it is the gift of God.” (Eph. 2:8.) The erroneous thought given by many is that our faith is not our own faith, not of our own volition, but an impartation, a gift from God. Of course, in one sense every gift and blessing which we enjoy is indirectly if not directly from God; “Every good gift and every perfect gift is from above, and cometh down from the Father of lights.” (Jas. 1:17.) But the proper understanding of the Apostle’s words, we believe, is this: It is of God’s grace and not of personal merit on our part that salvation is offered to us; and altho that salvation is offered to us as a reward of faith (including true faith’s obedience), yet we cannot even boast respecting our faith as tho it merited the Lord’s favor,—for our faith is something which is the indirect result of divine providence also; there are millions of others in the world who might exercise just as much faith as we if they had been favored of God with as much light, intelligence, knowledge, as a basis of faith: hence our faith is not to be credited as a meritorious condition but we are to be thankful to God for it, for the circumstances and conditions which have made it possible for us to exercise faith are of his grace. Posted on July 25, 2018 August 24, 2018 by Bible Students DailyPosted in Hymns of DawnTagged 1 cor 15, 1 Corinthians, 1 Corinthians 15:10, 1 John 3:1, 1 tim 2:6, 1 TIMOTHY 2:6, 2 Cor. 6:1, 2 Corinthians 6:1, Beliefs, benevolence, Bible Students, by grace ye are saved, Charles Taze Russell, chastisements, compassion, complacency, complacent, consummation, define God's grace, define grace, define mercy, define the grace of god, definition of grace, detest sin, disciplines, divine grace, Divine Love, divine mercies, evolution theory, Faith, favor, favour, forgiven, full consecration, godlikeness, grace, healing, Hebrews 4:16, help heal, helps by the way, hereditary weakness, high calling, Hope, humbled, hymn no. 21, Hymns of Dawn, in vain, independent, inherited sin, Isaac Watts, John 1:12, John 1:13, joint heirs, justified, justified by faith, little flock, love, meaning of grace, mercy, misrepresent, original watchtower up until 1926, our faith, Pastor Charles Russell, Pentecost, poems and hymns of dawn, purpose of ransom, ransom for all, renounce, renounce sin, Reprint 2283, repudiate, repudiate sin, restitution, righteousness, Romans 5, Romans 5:15, saved by grace, say no to, self sacrifice, self sufficient, sober, soberness, succor, support, the millennial age, the spirit of the world, theory of evolution, Titus 2:11, Titus 2:12, Titus 2:13, Titus 2:14, to assist, undeserved, undisposed, unmerited, unwilling, Watchtower, what does the word grace mean, what is faith, what is grace, who receives God's grace, who receives grace, wondrous grace.